For SSAT choir, 8 soloists (6 soprano, 1 alto, 1 tenor), piano. The nationally acclaimed large-scale choral work based on the Senate Judiciary Committee hearings of former Attorney-General Alberto Gonzales. 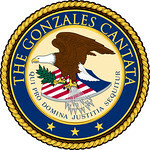 The Gonzales Cantata was performed at the 2009 Philadelphia Fringe Festival and received rave press and reviews from The Wall Street Journal, The Atlantic, The National Review, The Huffington Post, Harper's Magazine, Fox News, The Chicago Tribune, The Daily Show's Indecision Forever, Talking Points Memo, and MSNBC's Rachel Maddow, who featured the Cantata twice on The Rachel Maddow Show and called it "the coolest thing you will ever see on this show." Visit the official The Gonzales Cantata website.